The Headscarf Revolutionaries by Brian Lavery had been on the must-read list since the early days researching the House of Mirelle. 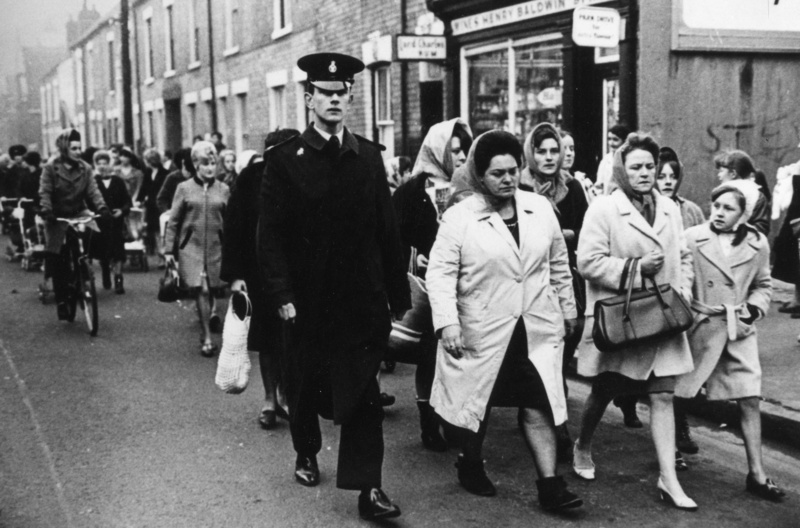 From information about Hull’s Headscarf Protest I turned to the history of the fishing industry and the Cod Wars. Lavery’s book sketched in the details in a work of such imagination and feeling, history came alive in my hands. 1968 was comparatively a slow year in terms of fashion history; the Indian and psychedelic influence was still being felt after The Beatles and the Maharishi and not much creativity had emerged since. But the late 60s was not a slow news year in terms of social history. In the US the civil rights movement had won the fight for real and lasting change and here in the UK a breeze was beginning to be felt, one that would usher in the turbulence of the early ’70s. Big Lil, who lead The Headscarf Protest was part of the movement taken onto the streets. She’d seen trawler after trawler from Hull go down and as January turned into February the unthinkable happened. Within the space of weeks 3 trawlers were lost with all hands, a terrible waste of life. The Triple Trawler Tragedy resulted in regulation of the fishing industry that had shaped life in Hull for hundreds of years. It happened at a time when the status quo was being challenged and social change was coming. Reading about the last years of the 60s rings true to the world we live in today. Sergeant Pepper was the soundtrack as homosexuality was made legal, debate raged about the taxation of single working women in comparison with men and 18 was about to replace 21 for the age of adulthood. Pierre Cardin’s space age look from 1968. Indistinguishable from similar fashions in this era. When you consider women’s fashions and powerful tremors felt at this time they appear incongruous to each other as if looking in different directions entirely. Only the growing popularity of the trouser suit hinted at the equality that was being fought for in the streets with placards and resolve like Big Lil’s. 1968 was the last year when the 60s swung during halcyon days of the pill, Twiggy and the Summer of Love. It’s hard to pinpoint difference when you look at 1968’s fashions but social change was swinging its arms and marching to make things happen.